Hold over and aim points become especially important as ranges increase and the shooter is using standard hunting scopes. These scopes typically require a coin or other small tool to make adjustments and have markings that are difficult to see in dim light. The ready availability of ballistics calculators today allows us to consider some non-traditional sight-in options for the normal hunter. Let’s consider the possibility of sighting the Grendel™ in with the group center 3.5 inches high at the 200 yards. The Hornady 129 gr SST™ and the Swift 130 gr Scirocco™ trajectories over the 300 yard range are shown below as a single line because they have effectively identical trajectories over this distance. Zeroing the Grendel™ 3.5” high at 200 yards yields a trajectory almost the same as that we would get if we used the “Maximum Point Blank Range” option in either the ballistic calculator available in Ammoguide (www.ammoguide.com) or their link to JBM Small Arms Ballistics (http://www.eskimo.com/~jbm/calculations/calculations.html). In this case the group center of impact will always be within 5 inches of the aim point within the maximum point blank range. How does this trajectory map into a deer-size target when the hunting conditions group size of 3 inches at 100 yards is applied? In close, the sights would be naturally placed at about where the shooter determines the heart to be. We can visualize the sight picture for intermediate distances by remembering that one of the common sight pictures for iron sights is the “six o’clock hold” — meaning the front sight is placed at the base of the target. Referring to the diagrams superimposed on the Champion XRay™ target, we see that the red “doughnut” represents the aim point, while the translucent circles show the likely group size and location at the indicated ranges of 50, 100, 150, and 200 yards. . This sight picture would work excellently for the Grendel™ for all ranges between about 40 yards and 225 yards. Out where range estimation starts to become an issue, we see that two different aim points, both completely within the deer’s chest, are useful. The first, which would apply from about 225 yards to 275 yards is effectively a hold vertically centered on the chest. The second, valid out to about 325 yards, is a hold just below the spine or at the top of the lungs. These more or less natural reference points help assure good shot placement as the range increases out to where most of us reach the limits of our shooting ability. Practice is especially important as we add complications resulting from changing aim points as range increases. The techniques above help minimize the different sight pictures, but we need opportunities to measure or judge distances and learn actual impact trends in actual field conditions. This practice is frequently obtained through varmint hunting. The 90‑grain Speer TNT load offered by Alexander Arms gives the 6.5 Grendel™ an interesting varmint shooting and plinking option. The recoil and noise should be between that of the .223 and the .243, making it very pleasant to shoot many times in a single shooting session. The trajectory for the 90 grain TNT™ sighted in at 3.5 inches high at 200 yards is shown below with those for the Hornady 129 grain SST™ and the Swift 130 grain Scirocco™ out to 300 yards. The trajectories are close enough to the same over this distance that lessons learned from varmint shooting should readily transfer to larger game out to about 300 yards. Let’s use the same technique for visualizing group sizes and aim points for one of the common varmint targets. Champion also offers the Critter Series™ targets that happen to have a groundhog with inch marks at life size intervals. 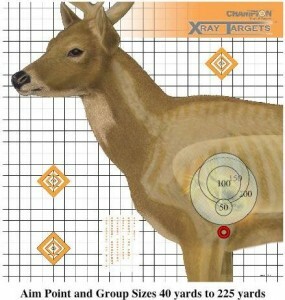 This target helps visualize the same shooting techniques when using the Grendel™ for practice on varmints. Again, should the target present itself at very close range, the center of mass hold works. Our six o’clock hold provides consistent hit opportunities from 40 yards out to 225 yards. As with the deer target, a shift in aim point for distances between 225 yards to 275 yards keeps the group centered on the target. 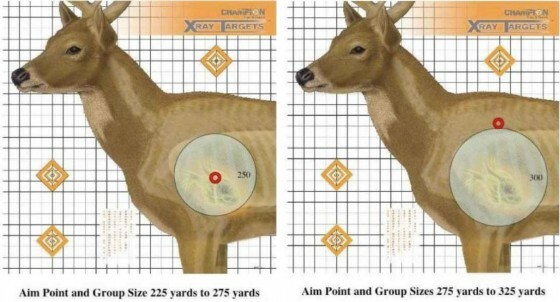 We can see from the figure that placing the crosshair on the forehead, analogous to the top of lung or spine centers the group on the target at ranges from 275 yards to 325 yards. Larger ranges will require different holds. Another interesting observation is that the area of the groundhog is not quite half of the area of the medium game vital zone. We can use this relationship as a measure of our shooting skills for the deer hunt. If, at any range, when we hit the groundhog less than half of the time, that range becomes the limit of our effective deer hunting range. In other words, the demonstrated shooting skills at that distance mean that we are likely to have an increasing number of ineffective hits on larger game at longer distances because they will be outside the vital zone. Acknowledgements: This article would have been a lot less interesting and more confusing without the excellent advice and encouragement from Charlie Cutshaw, Alane Alchorn, and Randy Collins. Charlie in particular brought recent experiences with the Mk262 to my attention. Thank you!